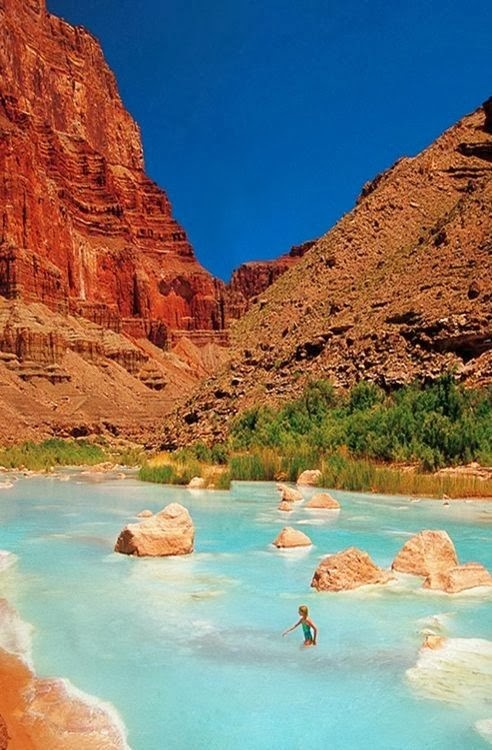 The Little Colorado River is a river in the U.S. state of Arizona, providing the principal drainage from the Painted Desert region. Together with its major tributary, the Puerco River, it drains an area of about 26,500 square miles (69,000 km2) in eastern Arizona and western New Mexico. This Colorado River tributary is over 315 miles (507 km) long, but being a transient desert river, its average discharge is typically less than 400 cubic feet per second (11 m3/s), and can vary greatly throughout the year. The river rises as two forks in the White Mountains of mid-eastern Arizona, in Apache County. The West Fork starts in a valley on the north flank of Mount Baldy at an elevation of nearly 10,000 feet (3,000 m), while the East Fork starts nearby, eventually joining together in a canyon near the town of Greer, forming the main Little Colorado River. It flows into River Reservoir, then leaves the canyon near Eagar. The river then turns north, meandering through Richville Valley, before emptying into Lyman Lake, impounded by a dam built for irrigation purposes. From there the river continues north, past the town of St. Johns. Shortly afterwards, the river transforms from a perennial stream to a transient wash as it travels northwestwards through Hunt Valley where it receives the Zuni River, then receiving Silver Creek and the Puerco River, its main tributaries, near the town of Holbrook as it flows into the Painted Desert.